The next Nexus. 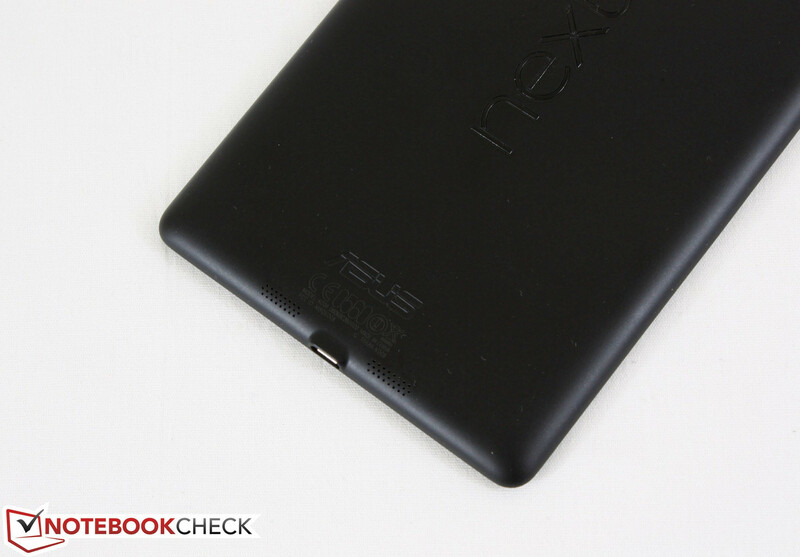 The first generation Asus Nexus 7 was arguably the best 7-inch tablet for $200.. so why mess with the price? 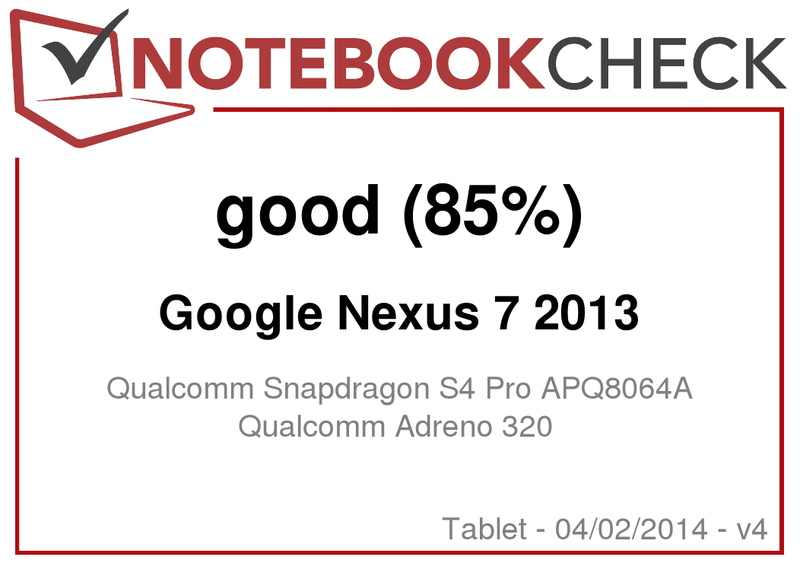 While the new Nexus 7 does cost $30 more than the original, it manages to improve every aspect both inside and out. See how this hot-selling hardware holds up in our full review below. 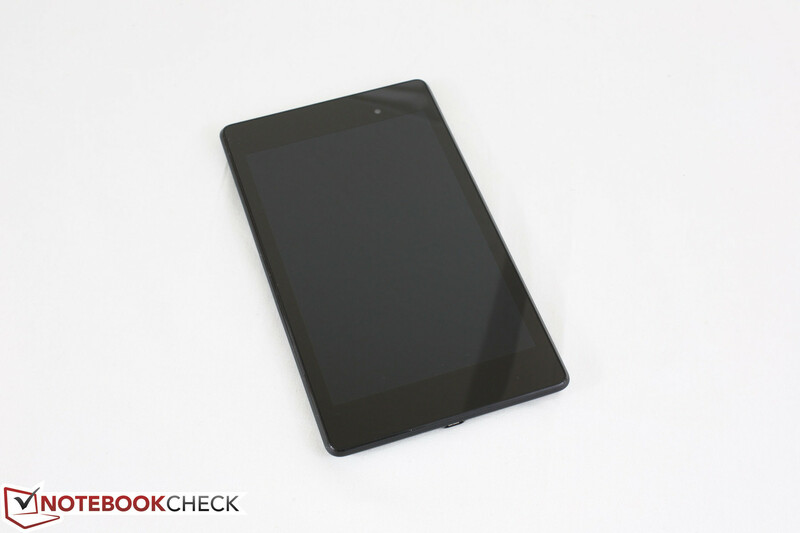 The original Kindle Fire sparked a wave of inexpensive Android tablets of similar size from many manufacturers. 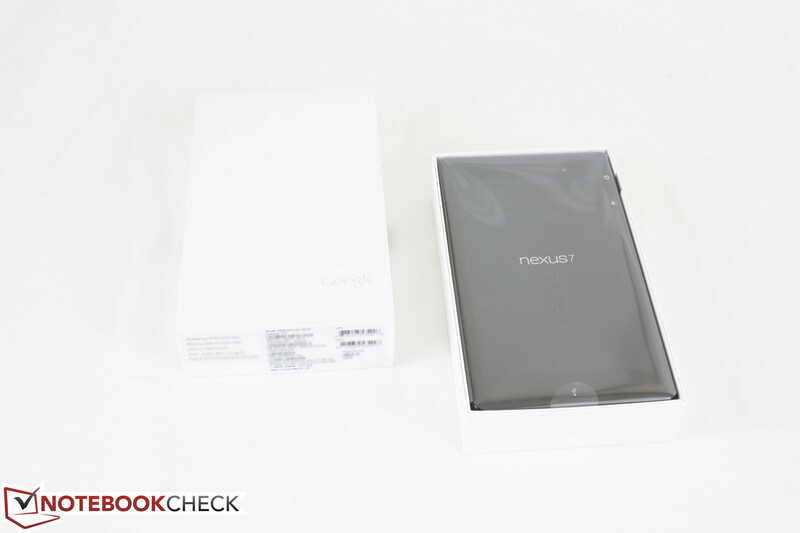 While most were forgettable, it was Google’s first generation Nexus 7 that received universal acclaim for its high performance and extreme value at the same $200 price tag as the Amazon equivalent. 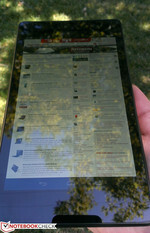 Even the Kindle Fire HD didn't offer enough features to fully topple Google's first Nexus tablet. Now exactly one year later and following the launch of the Nexus 10, the follow up to the best 7-inch tablet of 2012 is finally available and its internals already look promising. Both system RAM and internal storage have doubled from 1 GB to 2 GB and 8 GB to 16 GB, respectively, with a switch from Tegra to Snapdragon for both processing power and graphics. The dense 1920 x 1200 resolution display provides over twice the pixels of the first gen Nexus 7 and is the key distinguishing factor in a category inundated with 720p displays. It’s all great on paper – that is, until you realize that the new model retails for $30 more than the original for a total of at least $230. We find out in this review if the new Nexus 7 is a worthy successor to its lauded older brother and, ultimately, if it justifies the 15 percent price hike. Google has once again contracted Asus to manufacture the Nexus 7 successor, which is perhaps unsurprising given the praised construction quality of their metal alloy Transformer family of tablets compared to other Android devices. The new Nexus is still all-around plastic with a glossy Gorilla Glass front and a slightly rubberized matte back that feels similar in texture to the Kindle Fire HD 7. 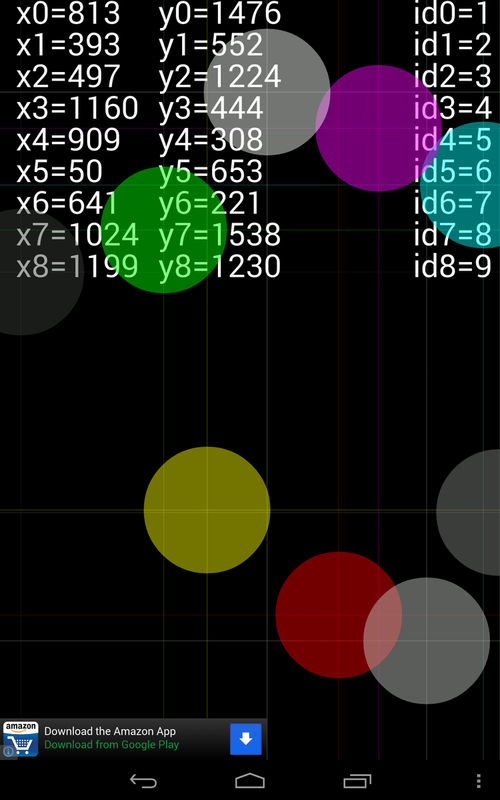 The dotted texture from the first generation Nexus 7 is now gone for a smoother and cleaner look. Fingerprints and dust do accumulate more quickly and visibly than the previous model as a result. Thickness and weight have been reduced to 8.65 mm and 290 g, respectively. This is compared to 10.56 mm and 340 g of the original, 10.3 mm and 395 g of the Kindle Fire HD 7 and 7.2 mm and 308 g of the larger 7.9-inch iPad Mini. Consequently, the new Nexus one of the lightest tablets in its size class and price range, which makes it that much easier to use outdoors or on-the-go. 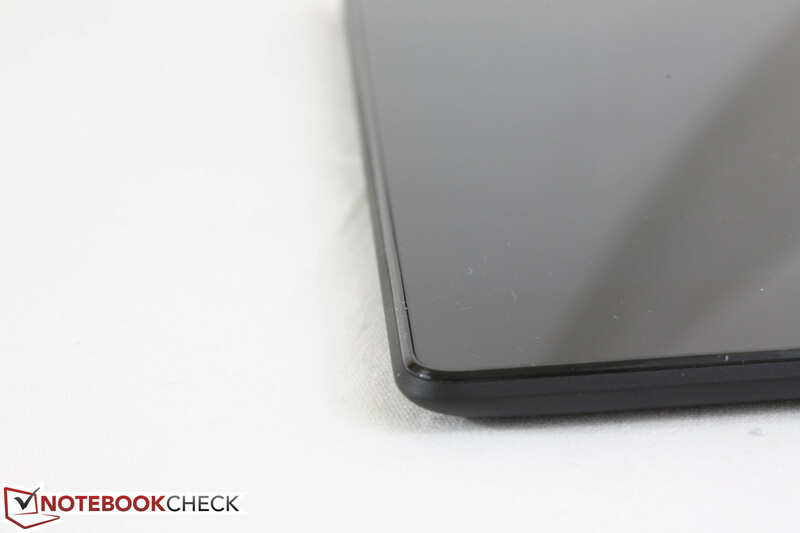 We noted in the first Nexus 7 review that the center of the backside can be depressed slightly with a finger, which suggests a small gap between the inner case and component directly underneath. 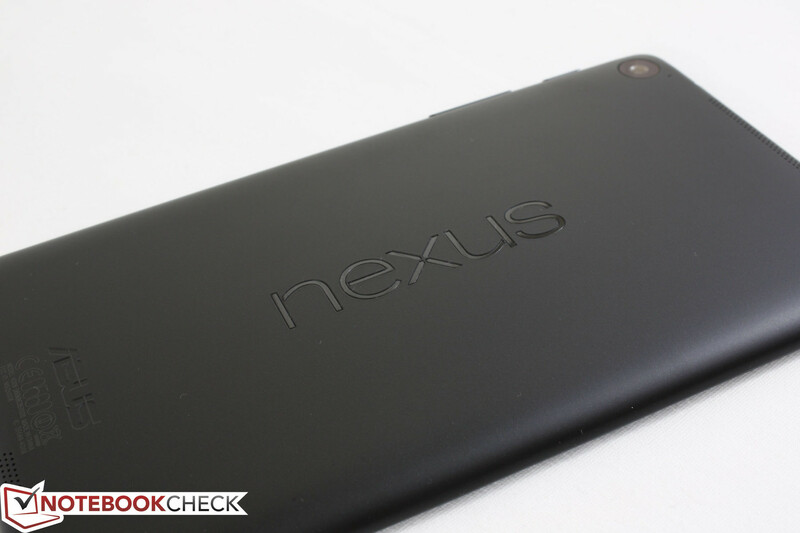 The same spot on the new Nexus shows no such depression and is a tighter package overall. Case quality is similar to the original. Slight side-to-side twisting is possible with a firm amount of force, but luckily no creaking can be heard. 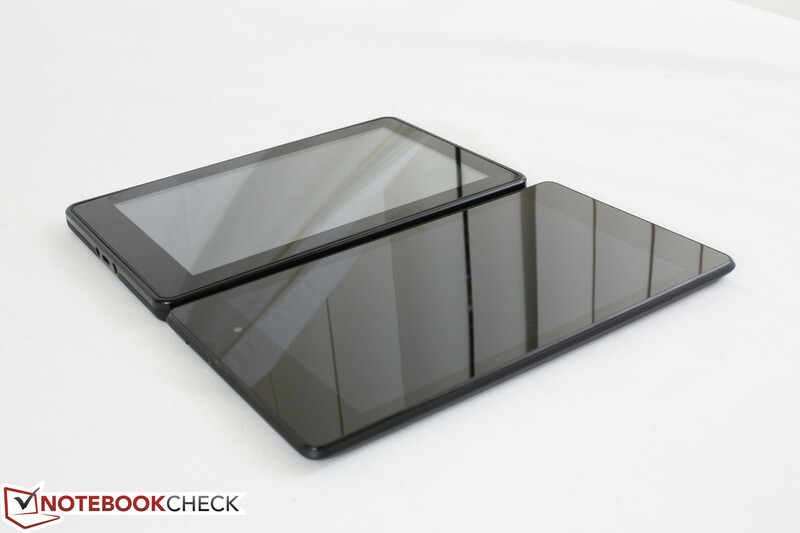 The plastic edges and corners don’t feel as hardened as both the original Nexus 7 and Kindle Fire and is more fragile when compared to the aluminum-enforced Transformer Pads or iPads. This may simply be attributed to the very light weight, but utilizing a protective carrying case would not be a bad idea for constant travelers. However, it’s clear that the extra $30 in price was not heavily invested in improving case quality. The new Nexus includes all of the connectivity options offered by the original Nexus, which isn’t saying too much. There are, however, a few surprises. The micro-USB port is still located on the bottom of the tablet while the 3.5 mm audio jack has moved to the opposite edge. The underutilized pogo pins of the original are now gone completely, which reduces the already low chance of ever seeing official keyboards and other similar accessories. We attached a micro-USB to USB adapter in an attempt to test standard desktop keyboards, mice and USB thumb drives. Keyboards and mice are recognized instantly, but we were unable to explore the attached USB drive. 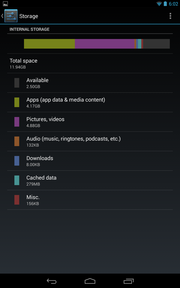 As such, expandable storage continues to be absent. Wireless display (WiDi) and SlimPort via micro-USB are available to alleviate the absence of a dedicated video-out port for those with compatible external displays. 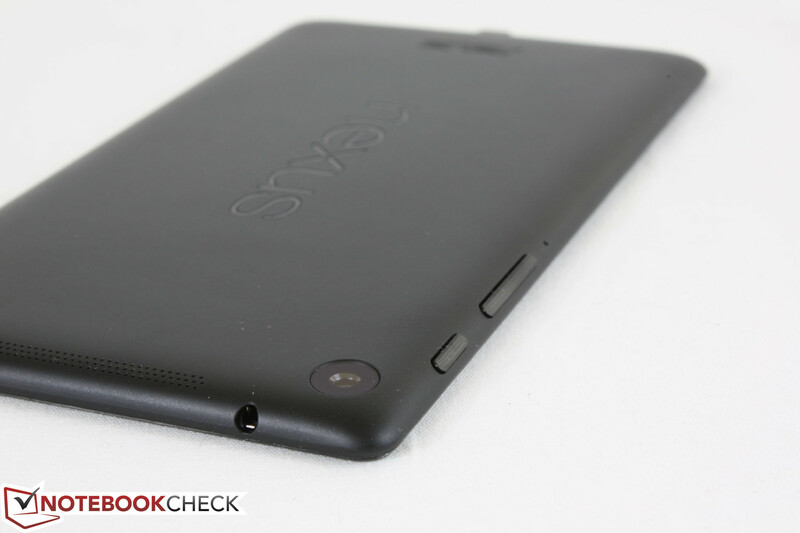 Even so, the Nexus 10 had a micro HDMI port and we would have liked to see something similar on the new Nexus 7. WLAN b/g/n is provided by a single stream dual-band (2.4 GHz and 5 GHz) module from Atheros with support for Bluetooth 4.0. Most notably, this module supports WiDi for the aforementioned wireless display above. We ran into no random disconnects or other connectivity issues during our time with the new Nexus 7 tablet. A model with LTE/HSPA+ support will be available in the near future for $350. The built-in GPS had no problems establishing a fix with available satellites. 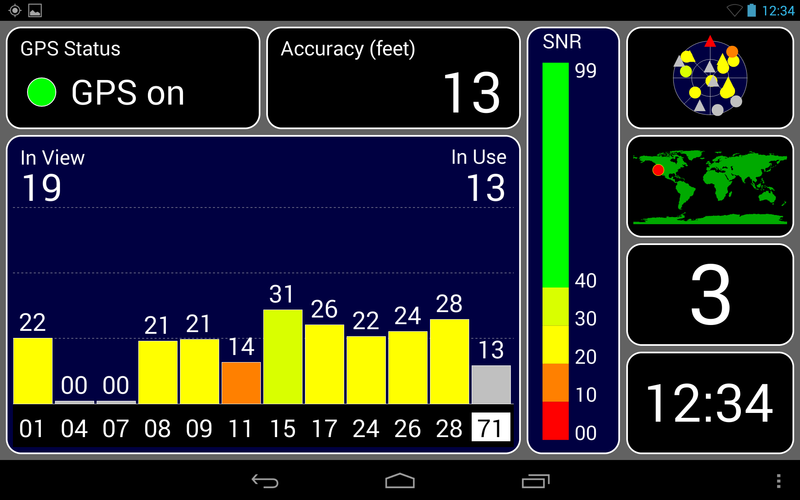 Accuracy is rough for the first few minutes at over 100 feet according to the GPS Test app, but this steadily improves to below 20 feet when outdoors. We experienced no random drops or abnormal GPS behavior with the tablet. NFC tags and sharing are supported. 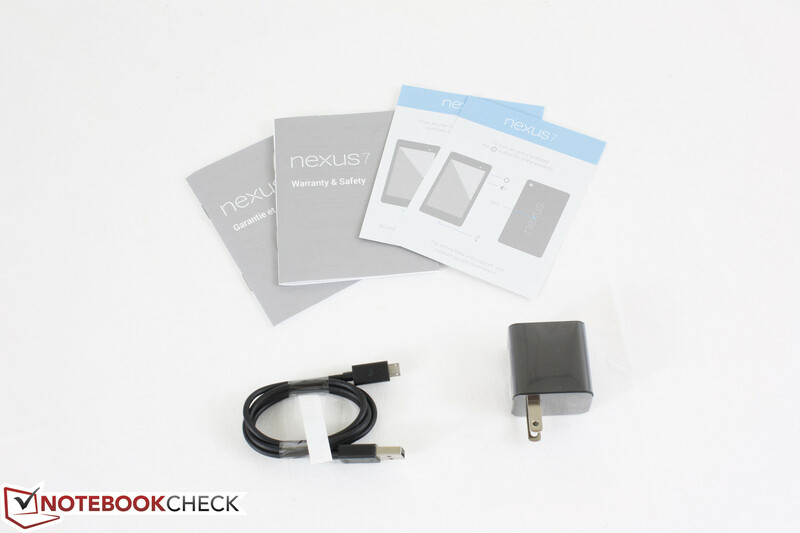 Note that the NFC tag or device must be placed specifically on the back of the tablet on the surface above the "NEXUS" logo. Placing the tag anywhere else and the tablet will not be able to identify or respond to it. Protection is provided by Asus for up to one year in the US. Beyond that, the manufacturer offers little else other than technical support through phone. As usual, users can add another layer of protection if purchasing the device from a brick and mortar location. 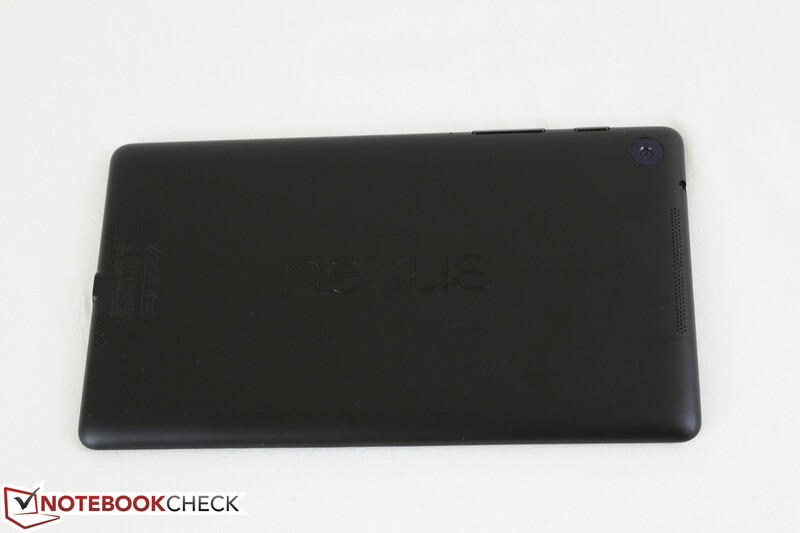 Unlike the first Nexus 7, the new Nexus includes a rear 5 MP camera. 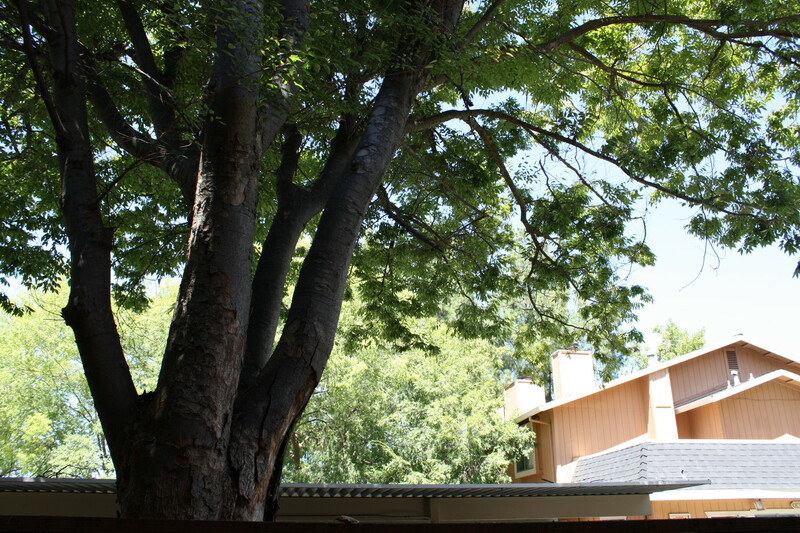 Pictures are serviceable in quality for outdoor use, though a noticeably blue overcast is present. Indoor shots fare a bit worse as pictures will appear blurry with lots of noise if lighting is below optimal. In such conditions, very still hands are required for a clear photo as no flash is present. Likewise, recorded 1080p video with the rear camera is smooth under well lit conditions. Fast movement with the tablet may cause the video to be out of focus briefly for more than a few seconds before automatic refocusing. 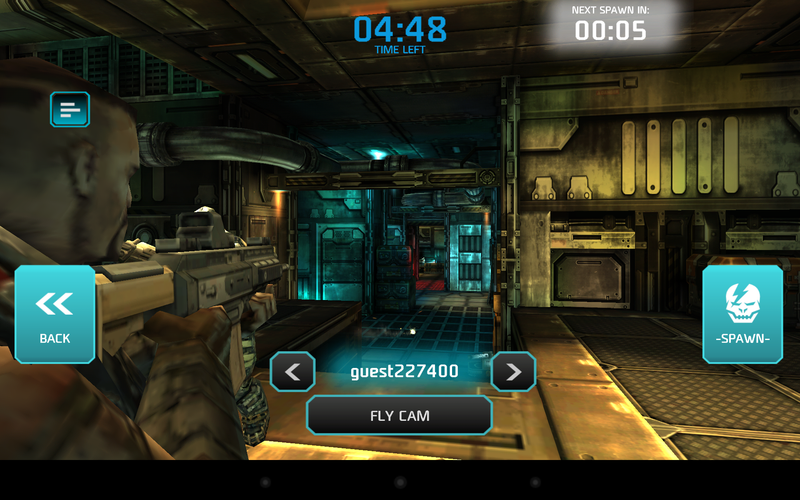 The front-facing 1.2 MP camera is almost as bad as the 1.2 MP camera on the original Nexus 7. It works for the occasional video conferencing if needed, but the picture is generally washed out with noticeable purple fringing and noise. Videos look absolutely gorgeous on the dense full HD display, especially if the source is native 1080p. We loaded the tablet with different video files - all native 1080p content - to check for compatibility and any playback issues. The built-in video player will play .mp4 and .mkv files without any noticeable frame skips or even distracting ghosting, while .avi and .mov files refused to play at all. Consequently, recorded videos are saved as .mp4. Incompatible files can still play via third party video apps, though playback quality can be mixed as a result. YouTube videos run flawlessly as expected. Swiping down from the top left and top right will show notifications and system settings, respectively. Aside from the power button and volume rocker, all inputs are entered via the 10-finger capacitive touchscreen. 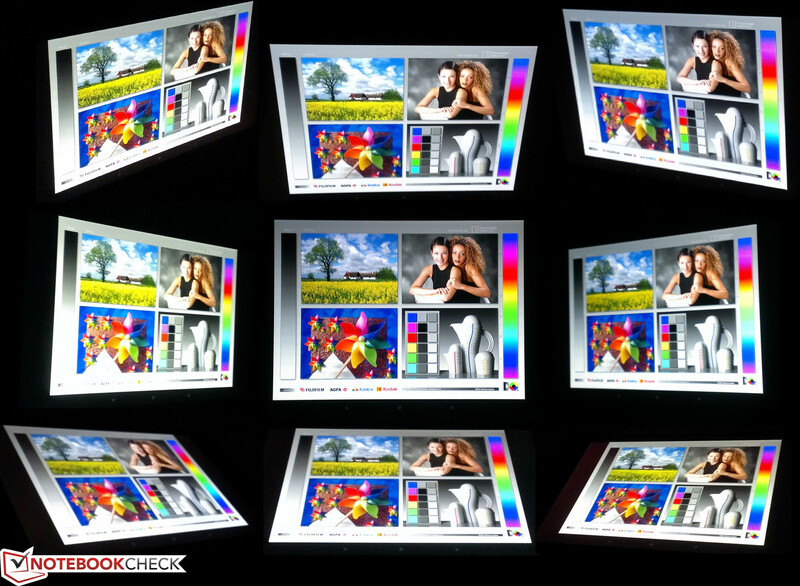 The display had no issues whatsoever recognizing clicks, swipes, scrolls and zooms and was able to perform them flawlessly. Users with larger hands may find it easier to input commands while in landscape mode as opposed to portrait mode simply due to the the wider bezel length for the palms. 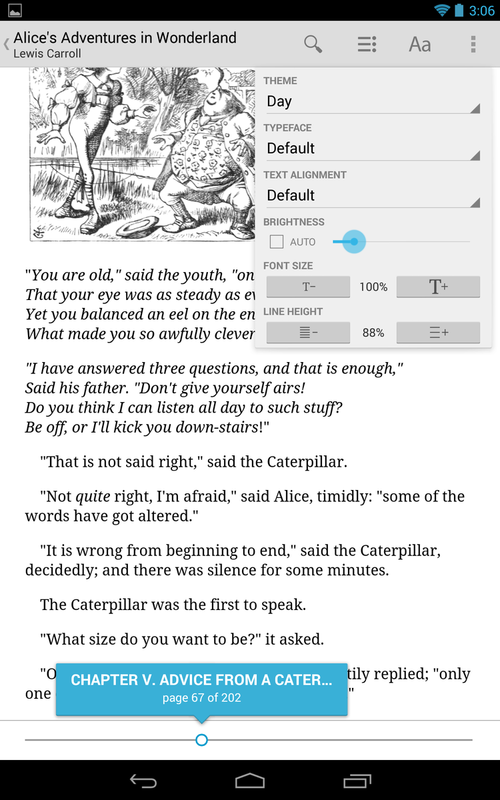 Meanwhile, the eReader includes all the options that one would expect such as keyword searches, font size, line height, note inputs, bookmarks and even a read aloud feature. The chapter search in particular is quite useful. 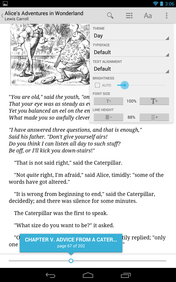 Though only a minor annoyance, pages will take more than a few seconds to load when scrolling quickly or jumping through chapters. The higher pixel density of the tablet also does little to improve the readability of English text, so those who intend to use the device mainly as an eReader can opt for the less expensive original model without missing any noteworthy features. 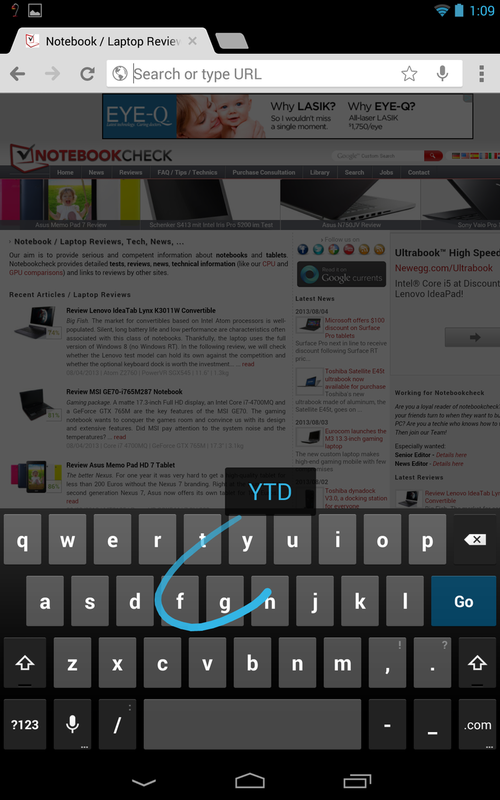 The virtual keyboard is the standard Android fare with Swype support automatically enabled. There are no additional layouts beyond the default, though there are different layouts for a number of other languages including Chinese and Korean. Note that there is no haptic feedback, which is similar to the original Nexus 7, so any and all key inputs will have auditory clicks instead. 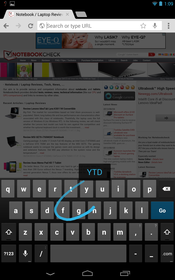 The three "Back", "Home" and "Tabs" buttons occupy a narrow row on the bottom or side of the display depending on the screen rotation, which is again similar to other Nexus devices. They are always visible and never completely hidden for easy multi-tasking no matter the current application. 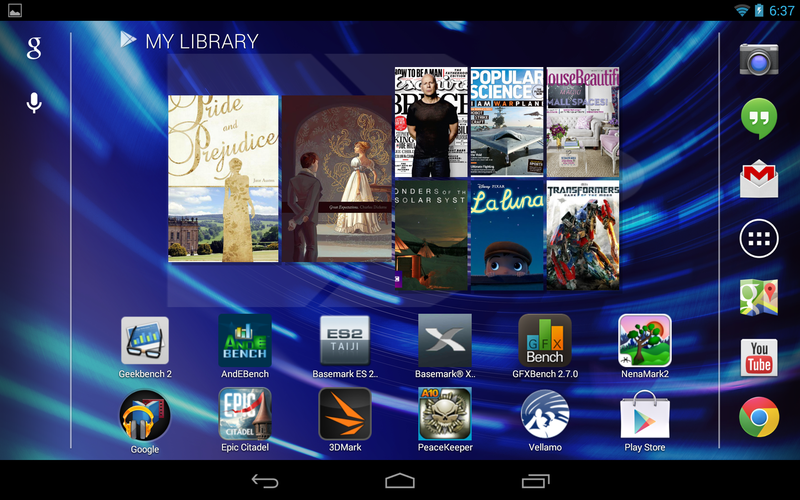 This is in contrast to the Kindle Fire where the onscreen "Back" button can sometimes be unavailable. 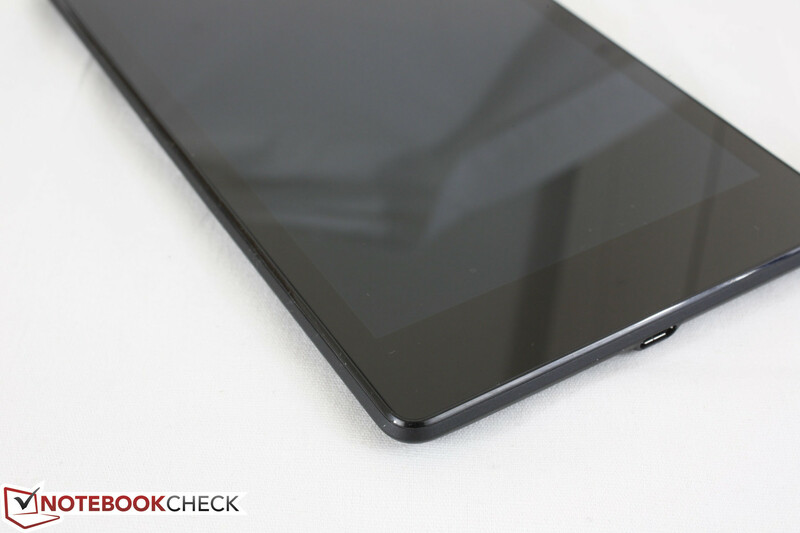 The new Nexus 7 is the first 7-inch tablet (7.02-inches to be exact) with a 1920 x 1200 resolution display. This effectively gives it a dot pitch of ~323 PPI, which is very close to that of the iPhone 5 and slightly more dense than the Nexus 10. Note, however, that the Back, Home, and Tabs buttons occupy a height of 96 pixels, so actual screen real estate will be 1200 x 1824 pixels. The backlight has improved dramatically from ~300 nits of the original model to over 500 nits on average with this second generation. This nearly matches the popular 10.1-inch Transformer Pad Infinity and is noticeably brighter than all 7- to 9-inch consumer tablets including the iPad Mini, Kindle Fire HD 7, HP Slate 7 and the Asus Memo Pad HD 7. The very high brightness may have caused the contrast to take a small hit at a measured ~500:1, which is a little less than all the above-mentioned tablets. Regardless, picture quality is already the best in its size class with no hints of artifacts, significant backlight bleeding or other abnormalities. Grayscale and color accuracy are both surprisingly good at no more than a deltaE deviation of 3 units and 5 units, respectively. 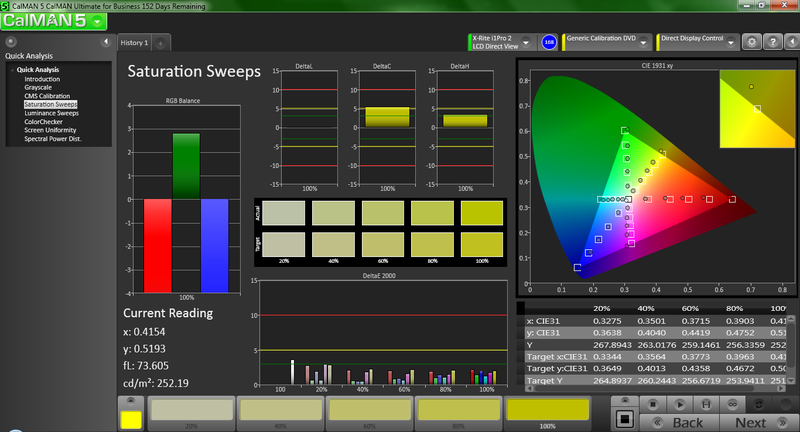 This only becomes more accurate the more saturated the colors are according to our tests with the CalMAN software. This is uncommon for most other tablets where the deltaE can be over 10 units for many colors under the same test conditions as seen in our reviews of the Galaxy Tab 3 8.0 and Iconia W3 810. 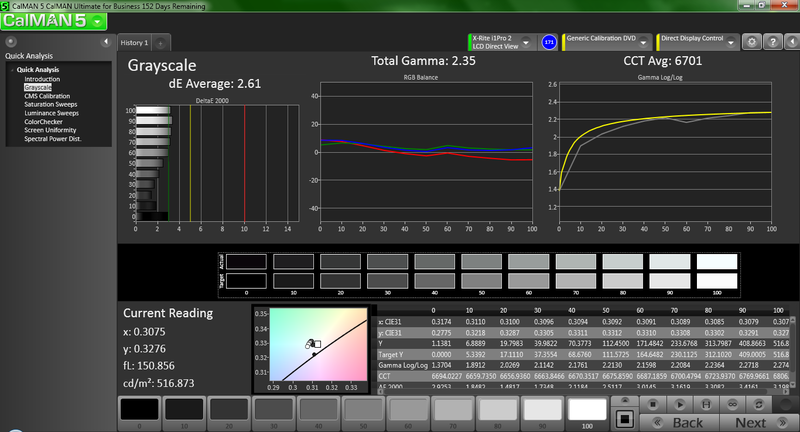 The 2.35 gamma is also close to the 2.2 ideal sRGB target while the 6701K color temperature is close to the 6500K standard. 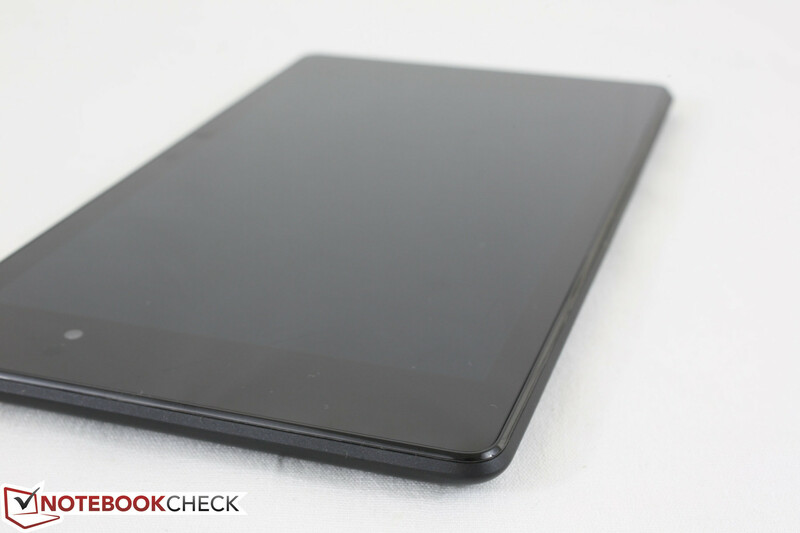 For such a low-priced tablet, the screen simply outclasses its competitors in this regard. The display is very easy on the eyes in outdoor situations. At high or maximum brightness, texts and pictures are still clear as day without washed out colors or causing any eyestrain. In short, the super bright screen and light weight make the new Nexus one of the easiest tablets to use while on-the-go. 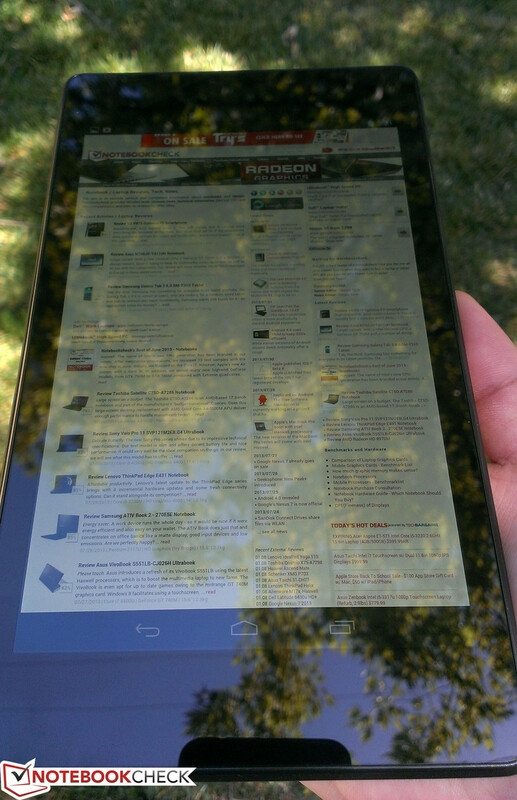 Even so, extended use continues to be a bit of a challenge if under direct sunlight, even if this tablet happens to be one of the brightest 7-inch consumer tablets currently available. 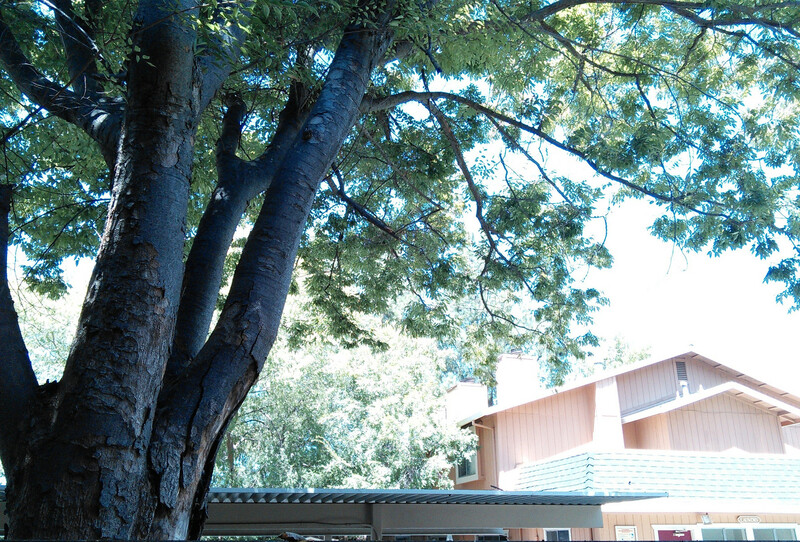 As a result, working under shade is still the better option for extended periods and to save battery life if needed. Instead, we found ourselves fighting glare most of the time on the reflective display and the even more reflective bezel surrounding it. The IPS panel display provides very wide viewing angles no matter the screen orientation. After witnessing the poor viewing angles of the TN panel on the 9-inch IdeaTab A2019A, an IPS option should be a necessity for any tablet regardless of size. 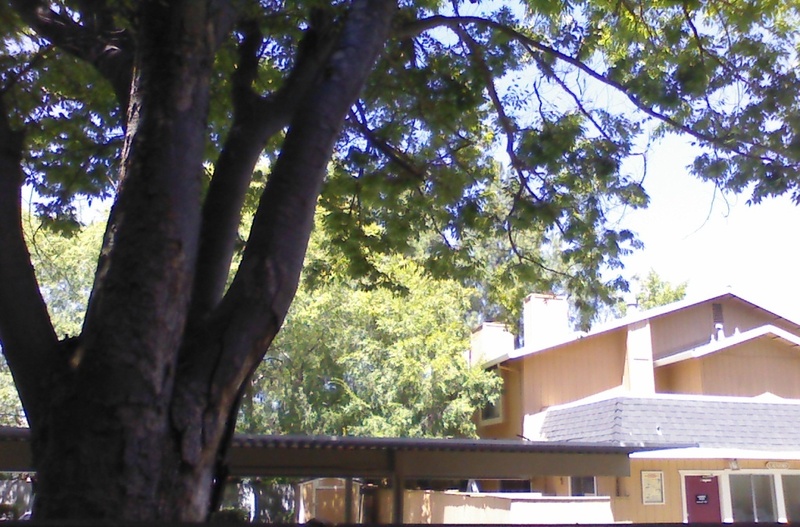 This is especially important outdoors where glare can be more easily avoided when wider viewing angles are possible. On the new Nexus, note that apparent brightness tends to decrease if viewing more than 45 degrees off in any direction from the center normal. In most situations, however, this will have negligible effects on usability. Google has switched partners from Nvidia on the original Nexus 7 to Samsung on the Nexus 10 and now to Qualcomm for the latest Nexus revision. 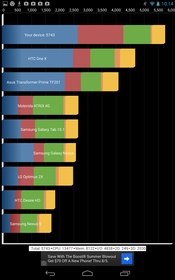 The 1.5 GHz Snapdragon S4 Pro APQ8064 is the same underclocked Snapdragon 600 SoC that powers a number of high-end smartphones including the high-end HTC One and, perhaps unsurprisingly, the Nexus 4. The quad-core 28 nm Krait architecture is a step up from other processors based on the Cortex-A9 standard, though it is not quite as feature-heavy as chips based on the newer Cortex-A15 architecture like the Tegra 4 or Exynos 5 Dual in the Nexus 10. 2 GB of low-power DDR3L RAM is available on the new Nexus, which is again similar to other high-end smartphones and tablets. 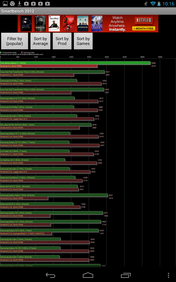 Processing power trounces the previous generation Tegra 3 according to Linpack and Smartbench benchmarks, but is still behind the proprietary Apple A6 cores as found on the much more costly iPad 4. Nonetheless, browser performance according to Peacekeeper, Browsermark and Sunspider is faster than many of the common and more expensive competitors. The Snapdragon APQ8064 is paired with an integrated Adreno 320 GPU, which supports a unified shader architecture and the OpenGL ES 3.0 API. 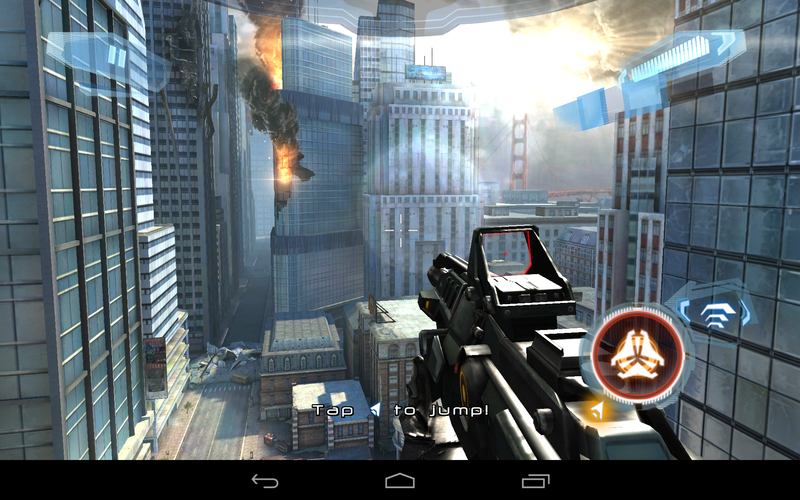 All tested games on the Android market are playable at smooth frame rates and without hitches. N.O.V.A. 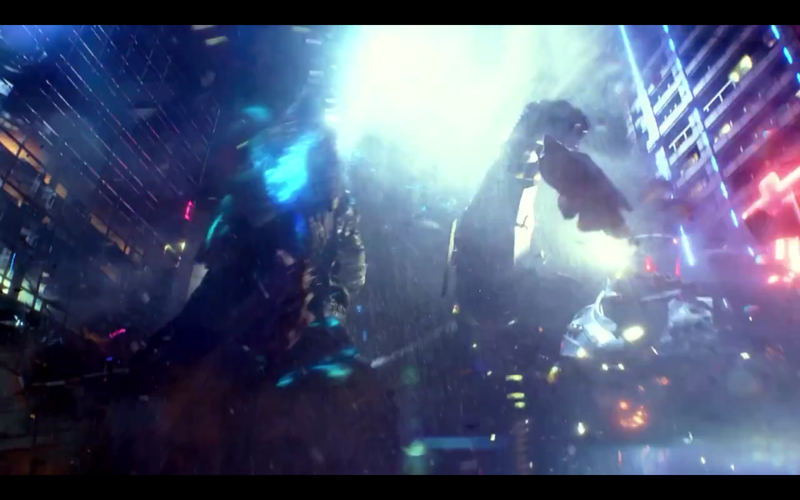 3, for example, does not drop in frame rate even during more intense segments. Graphics benchmarks such as NenaMark and Epic Citadel also run at close to 60 FPS, though the latter at its extreme 1080p settings will drop to a still respectable 38.5 FPS. 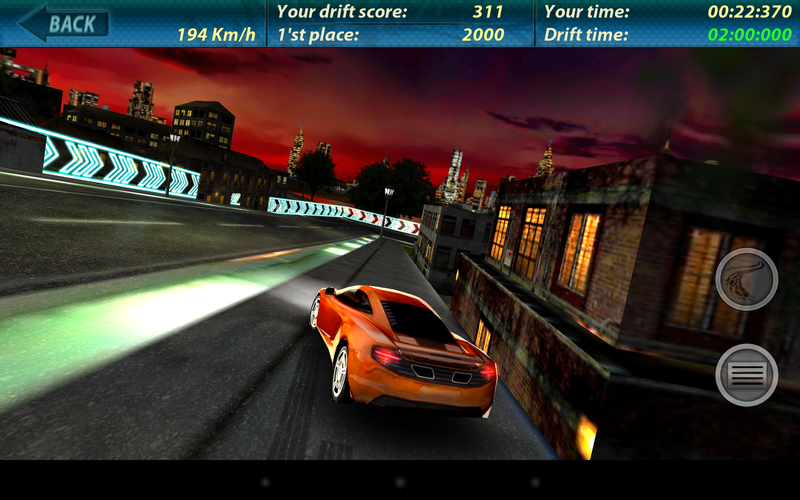 The GPU outperforms the almost 2-year old Tegra 3 across the board in raw graphical power as expected. Out of the 16 GB of storage, only 11.94 GB is immediately available to the user. 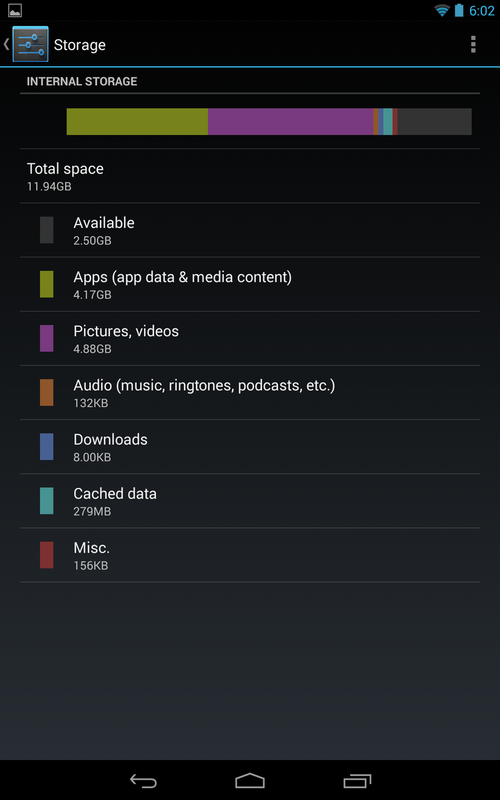 The lack of expandable storage means users will need to put down an additional $40 for the $270 32 GB model. 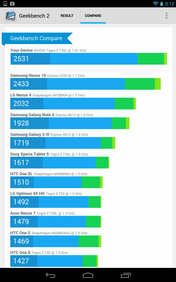 Fortunately, universal read/write speeds are an improvement over the original Nexus 7 and are comparable to the newer Nexus devices according to AndroBench. As a side note, the tablet will periodically run fstrim if it is idling or otherwise not in use in order to reduce write degradation overtime due to buildup of unused drive blocks. 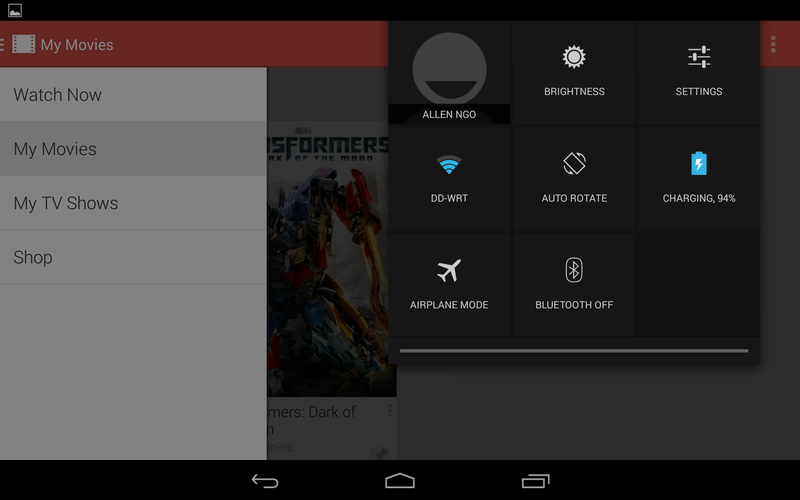 The automatic command is a feature as of the Android 4.3 update. When idle, surface temperatures are essentially at ambient evenly across all quadrants. This is unlike a number of other tablets where hot spots can clearly be felt even with no running programs such as the Slate 7, Iconia W3 810 and Galaxy Tab 3 8.0. Under heavier loads or during gaming sessions, the left hand side of the new Nexus tablet (the side with the two cameras) will begin to warm rather quickly. The opposing right hand side heats up as well, but at a much slower rate and to a lower maximum. 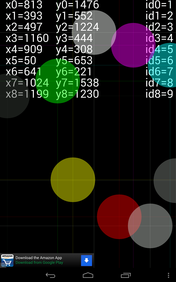 This eventually leads to one hand being warmer than the other during extended use if in landscape mode. Note that the measured maximum of over 45 degrees C below was recorded after running Stability Test 2.5 for over an hour, and so it is unrepresentative of typical use. It does, however, clearly show the general positioning of the processor and its ability to remain stable after long periods of maximum load. A temperature difference between the hands can still be felt during longer browsing and gaming sessions, but it is in no way bothersome. 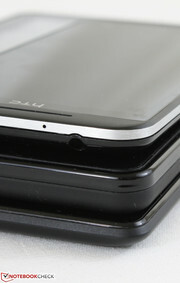 The stereo speakers are located on the edges of the back of the device and face away from the user. Each of the two grilles cover one speaker, which is different from the original Nexus 7 where there was only one grille covering two speakers. The more even distribution of speakers on the new Nexus allows for more balanced audio with less muffling. Even so, sound quality feels tinny because of the lack of proper bass reproduction. This becomes more apparent at higher volumes when sounds become more narrow in range and the tablet begins vibrating. The positioning is also unfavorable if using the tablet in landscape mode since the palms will be right over the grilles, further muffling sounds. Quality is sufficient for the occasional music and video, but is simply not as good as the speakers on the original Kindle Fire. 3.5 mm external headphones are recommended if streaming music or video to fill a living room. The internal lithium-ion polymer battery provides 3950 mAh (or 16 Wh) of power, noticeably less than the 4325 mAh battery of the original 7-inch Nexus. 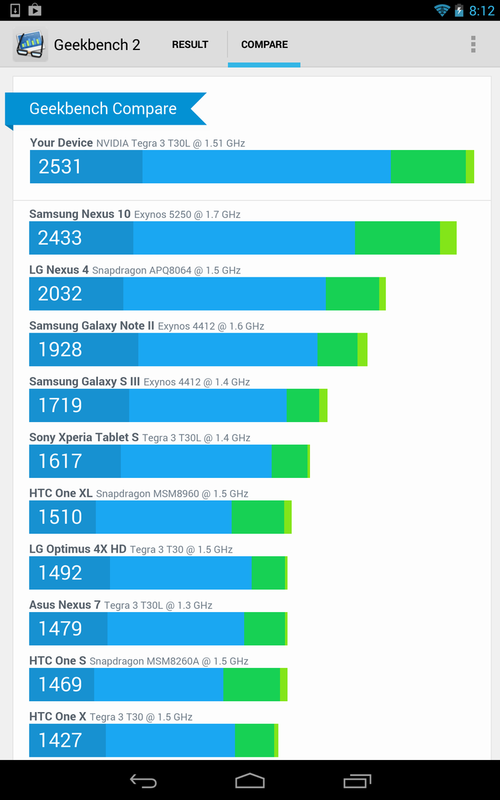 It's safe to assume that both hardware and software optimizations have compensated for the smaller capacity battery as our runtime tests are somewhat similar to the older Nexus 7. With no apps running while sitting idly on the home screen, the new Nexus was able to last for over 44 hours. During this time, wireless radios were deactivated and the screen was dimmed to its lowest setting and not allowed to timeout. On the other end of the spectrum, we ran Stability Test 2.5 to fully stress the CPU and GPU at maximum screen brightness with wireless radios active until automatic shutdown. The tablet was able to last for roughly 3 hours and 20 minutes before shutdown. The more realistic WLAN test puts the display at 150 nits (about 25 percent brightness setting) while looping our continuous script to simulate typical browsing conditions with no screen timeout. This test is identical to our WLAN test for notebooks. 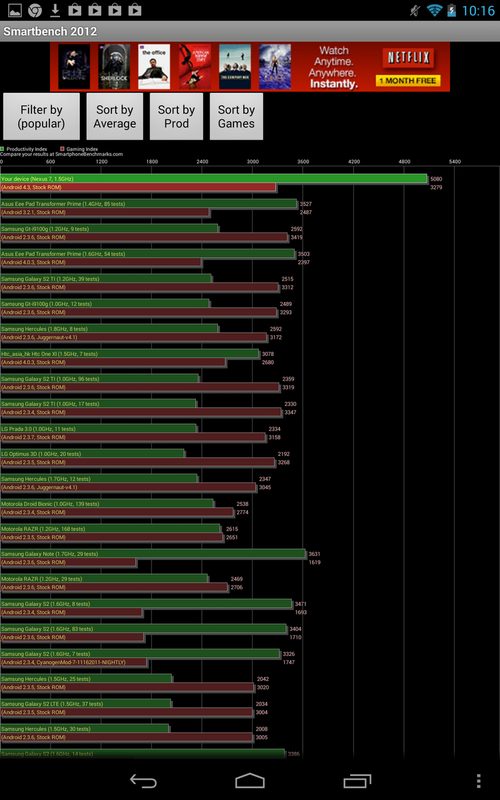 At 6 hours and 51 minutes, the new Nexus is essentially identical to the original Nexus 7 in WLAN runtime. The large discrepancy between idling and WLAN runtimes means users can get away without charging the tablet for a few extra days longer. More conservative brightness and system settings will also net much more battery life this time around. Otherwise, expect around 7 hours of constant use before needing to recharge. In comparison, this is a couple hours sooner than the Kindle Fire HD 7, but similar to the Slate 7 and 10.1-inch Transformer Pad Infinity. 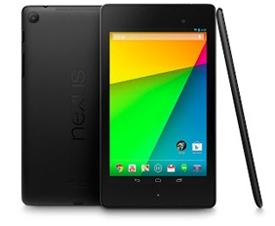 The second generation Nexus 7 retails for $30 more than the first model. If based solely on its build, the price increase does not feel justified as the quality is only a modest upgrade over the original. The model still lacks expandable storage, dedicated video-out and docking station support. Users with the 16 GB model may find themselves out of space quite quickly after realizing that almost 5 GB is unavailable. Once the display is powered on, however, it becomes easy to see why the price tag carries that extra $30. 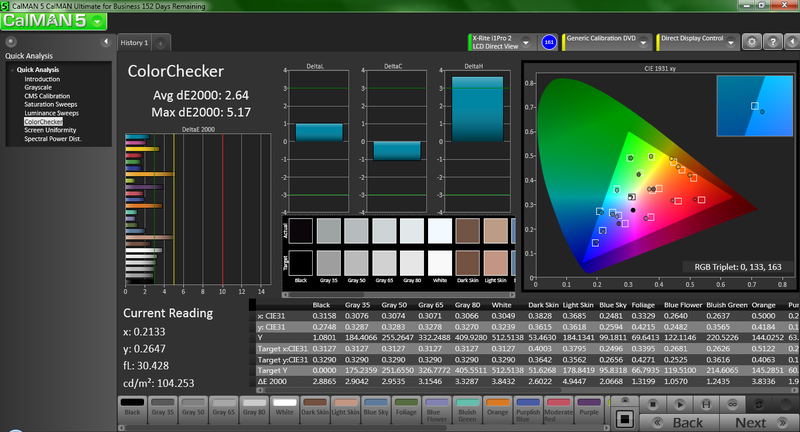 The screen is currently the best and brightest available on a 7-inch device with very accurate colors to boot. The Snapdragon processor has no problems keeping up with the animations and high resolution while the light weight makes it one of the best tablets for use outdoors. It's clear that the extra cost in materials was invested in the display and internals rather than in greatly improving case quality and connectivity options. Users looking for a 7-inch Android tablet should look no further as this is (yet again) the overall best in its size class. The still competitive price only makes the deal even sweeter. Everything has been improved over the original. The new Nexus 7 is lighter and thinner without sacrificing rigidity with more powerful internals and a very bright 1080p display. The model outperforms most larger tablets. Unfortunately, the $30 price hike may be enough to deter some users regardless of the improvements. Expandability is also very limited with no microSD slots or cabled video-out options. Tablet can become quite warm under sustained heavy loads. The higher starting price is more or less justified. The display alone is unmatched in this price range.